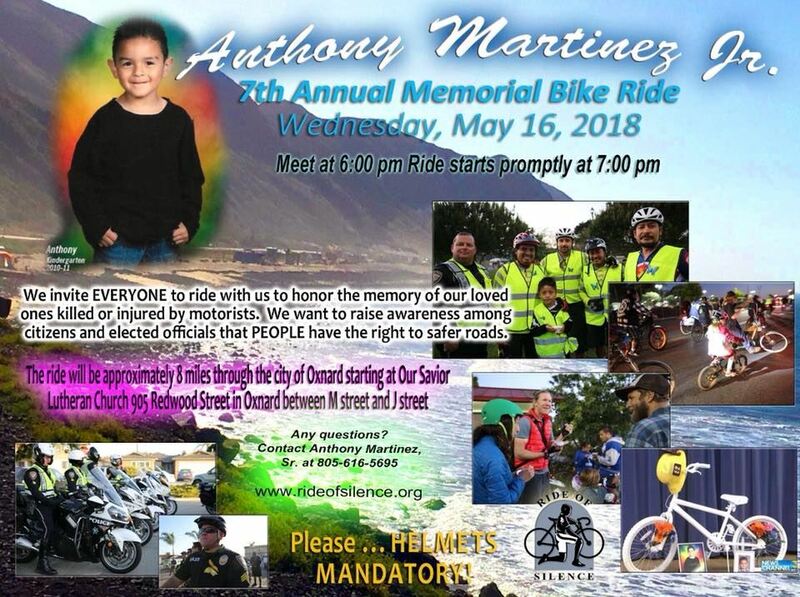 Join us for our annual Anthony Martinez Jr. Memorial Ride of Silence in Oxnard. Meet at 6pm roll out at 7pm, this is a slow paced family ride that loops back to the start. The ride will go through Port Hueneme and Oxnard starting at Our Saviors Church parking lot at 905 Redwood St in Oxnard between M Street and J Street. We invite everyone to ride with us to honor the memory of our loved ones killed or injured by motorists. We want to raise awareness among citizens and elected officials that PEOPLE have the right to safer roadways.